The new Skype 8.19 has build in the call recording feature. That you can record your Skype video calls without Skype call recorder. Please click the “+” icon when your Skype video call get connected, then click the “Start recording” menu to start the recording. It will record your video calls using side by side – Portrait mode. And it will show the recording status at the top of your Skype windows. This call recording feature is FREE provided by Skype. 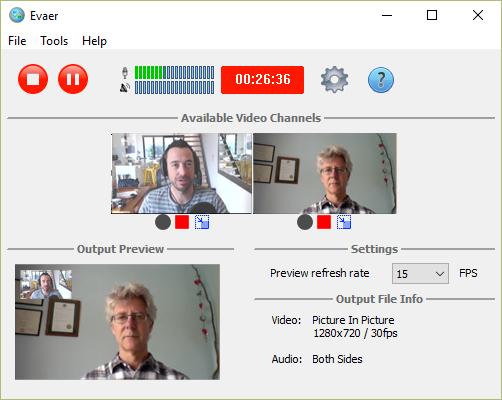 But if you want to get more powerful capabilities for recording your Skype video calls, I suggest you use the Evaer Skype recorder , It provide much more powerful features, such as recording udio only, Picture-in-Picture Skype video recording mode, side-by-side-landscape / portrait Skype video recording mode, remote cameras only Skype video recording mode and so on. You can also switch video dynamically while recording a Skype video call, such as if you want to record the remote video only while the remote person is talking, just click the “Stop” button under the video channel. Then you can click “Start” to record your video again as your need. This entry was posted in Skype Video Recorder and tagged Free recording Skype video calls, Free Skype call recorder, Record Skype calls Free, Skype build in on April 10, 2018 by admin.